Inevitably, even the best cared for blades will go blunt, and when this happens, our clipper blade sharpening service is needed. 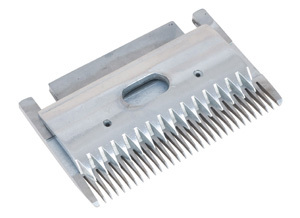 Our highly trained staff use high-end, specialist equipment to sharpen most makes of clipper blades to standards on par with any on the market. We believe that our system is by far the most straight forward out there. We get constant feedback from our customers amazed at the simplicity, speed and price of our service. All our service prices include postage from our customers as well as the postage back. Our team’s unique blend of small animal groomers, large animal groomers, vets and career long machinists means that with over 100 years combined experience there is no problem we can’t solve. Clipper Blade Sharpening by Shear Ease Ltd.
We realise that a groomer without sharp blades is a groomer without livelihood, that’s why we carry out clipper blade sharpening, reconditioning and return of blades in ONE working day. Your blades get sent back to you the same day they arrive here! SHEAR EASE WELCOME BULK ORDERS & CAN OFFER FURTHER DISCOUNTS ACCORDINGLY, PLEASE PHONE FOR DETAILS. ALL PRICES INCLUDE INWARD POSTAGE, RETURN POSTAGE AND VAT. PRICED PER SET.